The town of Yarmouth is among Cape Cod's richest in terms of beaches, both fresh-water and salt-water, facing both Nantucket Sound and Cape Cod Bay. Most of Yarmouth's salt-water beaches are along the southern shore on Nantucket Sound in West Yarmouth and South Yarmouth, but there's one—Bass Hole (Grey's) Beach—on the north shore facing Cape Cod Bay. In addition, Yarmouth has four fresh-water beaches on town ponds. Here's a map of all Yarmouth's beaches. Small but nice no-fee beach with a small unlocked parking lot at the southern end of Bayview Street. Portable toilets in summer, no other services. Small no-fee sea beach with a small unlocked parking lot at the southern end of Standish Way. Portable toilets in summer, no other services. This small sea beach at the southern end of Berry Avenue has a small parking lot, but no other services. This small freshwater beach on the shore of Little Sandy Pond in the Sandy Pond Recreation Area off Buck Island Road has advantages: if not everyone in your group wants to swim, the forested Recreation Area has softball and soccer fields, tennis and basketball courts, a picnic area and playground, and public toilets. Yarmouth's largest beach, down South Sea Street, has a big parking lot (locked at night), a large bathhouse with showers, and food stands. 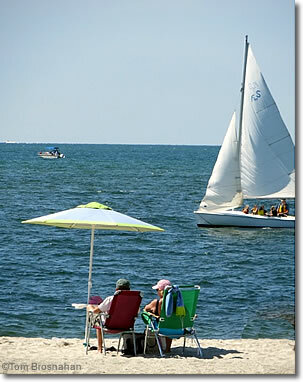 Bass River is perhaps Yarmouth's most splendid beach on Nantucket Sound, the eastern end of a broad stretch of fine white sand that stretches for miles toward the southwest. Bass River (Smugglers) Beach, South Yarmouth, Cape Cod MA. The freshwater	beach on forested Long Pond north of MA Route 28 has a small playground, a basketball court, and portable toilets. The beach and recreation area at freshwater Flax Pond, south of US 6 (the Mid-Cape Highway), has a baseball field, volleyball and basketball courts, public toilets, and a picnic area. The southwestern continuation of Bass River Beach, Parker's River Beach also has a fairly large parking lot (locked at night), a bathhouse and showers, food stands, and a children's playground. Follow Seaview Avenue south to the beach, then South Shore Drive northeast to the parking lot. The southwestern continuation of Parker's River Beach, Sea View has a smaller parking lot than Parker's (locked at night), and fewer services: a picnic area and portable toilets in summer. A small residents-only beach open to Town of Yarmoith property-owners and -renters. Narrow Wilbur Park Beach, on the Bass River just south of Highbank Road, has no services except picnic tables. The smal parking lot is locked at night. Off River Street on the Bass River, Windmill Beach has—surprise!—a windmill, which is its greatest asset. The small parking lot is locked at night. This unlocked no-fee beach off the northern end of Center Street has toilets and a picnic area. The small freshwater beach on Dennis Pond off Summer Street is a pleasure with the little ones. 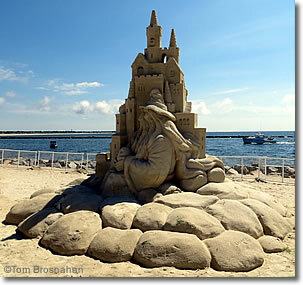 Wizard's Sand Castle on Bass River Beach.